As believers, is it okay to do yoga? Is it “just exercise,” or is there more to yoga than meets the (third) eye? Former New Age yoga instructor, Laurette Willis, shares from her 22 years in yoga (ages 7 to 29). As the founder of PraiseMoves, “The Christian ALTERNATIVE to Yoga,” Laurette shares a perspective that is resonating with many believers and ministry leaders today. Featured in Christianity Today, Charisma and TIME magazine, Laurette is also a published author with Harvest House and Destiny Image Publishers. * What yoga poses really are, and what they are designed to do. * Can the spiritual elements of yoga be removed? * Should yoga be offered in churches and schools? * Is “Christian yoga” still yoga? Hear what Hindu and Christian leaders say are the dangers of yoga for the Christian, and discover some effective, Christ-centered options to yoga. Find out if Fitness Ministry is for you, and how to start a Fitness Ministry in your church or community. 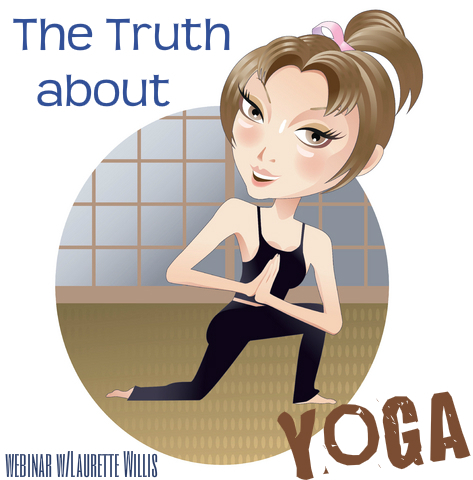 Everyone who registers will receive Laurette's guide, “The Truth About Yoga: Peaceful Practice or Dangerous Deception?” with helpful tips for fitness and fitness ministry.